Using their Embraer E190-100IGW aircraft, Airlink brought in this inaugural flight from OR Tambo International Airport in Johannesburg. 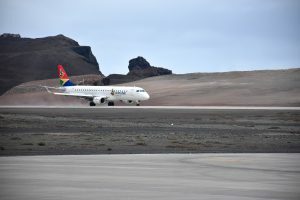 Airlink will now operate a weekly service between St Helena and Johannesburg and St Helena and Cape Town (with a stopover at Windhoek International Airport). 72 passengers comprising returning Saints and invited guests – Tour Operators from Eastcape Tours, Get Africa Travel, Springbok Atlas and Island Holidays, International media – BBC, ITV, The Times, Thomson Reuters, Associated Press and other publications – were greeted by HE Governor Lisa Phillips on arrival and then by a full St Helenian welcome. A reception at Plantation House was hosted by Governor Lisa Phillips for all passengers onboard the inaugural flight and for key people involved in the arrangements leading up to the big day. Airlink will also operate a monthly charter service between St Helena and Ascension Island. This service will commence on Saturday, 18 November 2017.